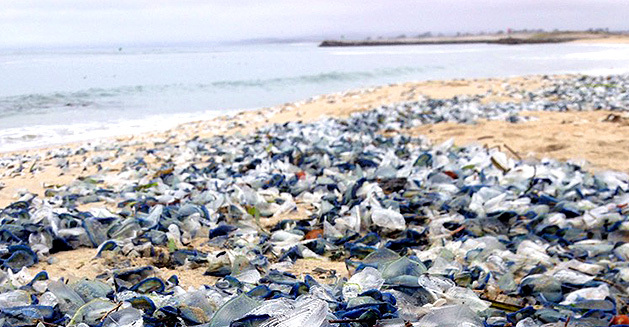 Velella velella, also known as by-the-wind sailors, normally live in the open ocean, but occasionally thousands will wash up on California beaches. Image courtesy of Steve Haddock. Are jellyfish populations increasing around the world? Like the weather, jellyfish blooms are something that many people talk about, but few people do anything about. One exception would be MBARI’s Steve Haddock, a marine biologist who has been studying jellies for more than two decades. Haddock recently rolled out a new and improved website (jellywatch.org) that allows citizen scientists around the world to report jellyfish blooms. Haddock first set up the JellyWatch site about 10 years ago, in an attempt to use citizen science to find out about jelly blooms worldwide. Designed by Haddock and two summer interns, the original JellyWatch site was a joint effort by MBARI and the Monterey Bay Aquarium. 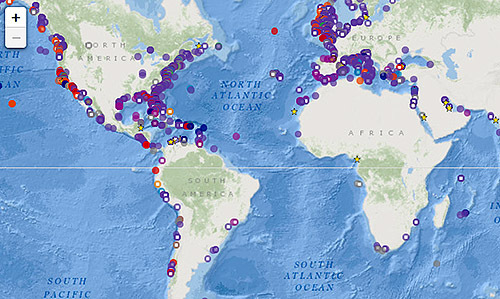 This map shows the locations of some of the jelly sightings recorded on the JellyWatch site from around the World. The jellywatch.org site was quite popular; by March 2010 it already had observations from every continent except Antarctica. For years it allowed people from all over the world to report and share jellyfish sightings, as well as photos and observations of other transient ocean events. Unfortunately, due to difficulties with funding and website hosting, the JellyWatch site went dormant in 2018. But just this month, Haddock rolled out a new and improved JellyWatch site, funded in part through a grant from the National Science Foundation. This dramatic photo shows a black sea nettle that washed up on Moss Landing beach in Monterey Bay. Image courtesy of Steve Haddock. Like the original site, the new JellyWatch site lets you report sightings of jellies and other marine life, but it is even more interactive. 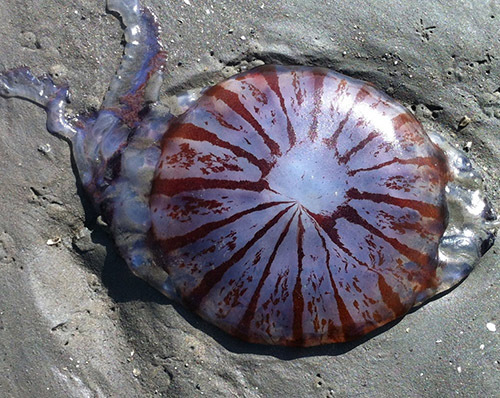 You can submit jelly photos for identification by experts around the world. You can also browse maps and photos showing all the observations recorded over the past 10 years. Even better, you can download records of all these observations and analyze them to look for patterns or unusual events. The site also features a running list of those JellyWatchers who have contributed the most observations. For those who just like to look at jellies, there are lots of still images of jellies on the new site, and even a few jellyfish videos. The JellyWatch photo gallery includes beautiful photos of jellies from Monterey Bay, Washington State, the Florida panhandle, Canada, and Scotland. There is also a JellyWatch Facebook page for those who like to share images on social media. Over the years, the JellyWatch site has been used by researchers, teachers, and jelly enthusiasts. One grade school teacher developed a classroom curriculum about jellies that uses data from the site. Jellywatch data have also been used in one scientific paper and a second paper will be coming out later this spring. 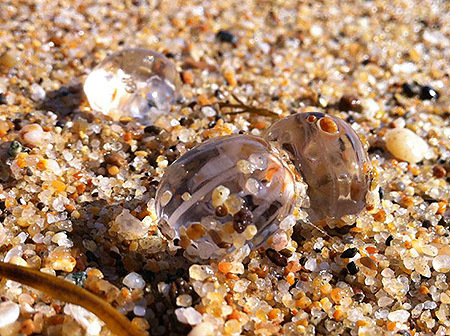 These ctenophores, commonly known as sea gooseberries, are another jelly commonly observed along the California coast. Image courtesy of Steve Haddock. The JellyWatch database currently contains almost 6,000 observations. Even though these observations have not yet demonstrated significant long-term trends in jelly blooms, they have inspired many professional and amateur jelly watchers, and brought attention to a fascinating but often overlooked group of marine animals. So if you see a mystery blob on the beach, report it at jellywatch.org. You will be contributing to our understanding of life in the sea, and you will actually be doing something about jelly blooms. Aug 12, 2014 – During a recent remotely operated vehicle (ROV) dive, MBARI researcher Rob Sherlock observed an ambitious Solmissus jelly eating a siphonophore, Praya dubia. Last week, MBARI’s midwater ecology group conducted research from the R/V Western Flyer using ROV Doc Ricketts in Monterey Bay. May 27, 2014 – Far below the ocean’s surface, sunlight does not reach the deep sea. But many deep-sea animals display an astonishing array of vibrant colors when they are illuminated by the bright lights on MBARI’s remotely operated vehicles.